This kit demystifies DNA's and RNA's connection to protein synthesis. Students construct a model of DNA, replicate it, and use half of the ladder to build messenger RNA (mRNA). Placing mRNA on a model ribosome simulates transcription in the nucleus and the movement of mRNA. Students simulate translation by matching the mRNA and its codons to transfer RNA (tRNA) and its anti-codons. Amino acids bond to form a protein molecule, and students experience how information stored in DNA is expressed as a finished protein. 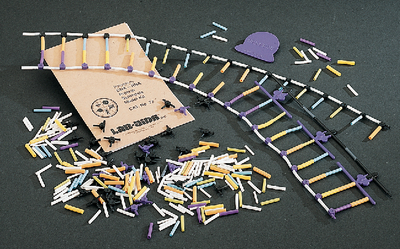 Ordering information: This kit includes a teacher’s guide, student worksheets and guides, white tubes, adenine (orange tubes), amino acids with R group, cytosine (blue tubes), deoxyribose sugars (black), guanine (yellow tubes), hydrogen bonds (white rods), peptide bonds (gray tubes), ribose sugars (purple), ribosome, thymine (green tubes) , tRNA (purple), and uracil (purple tubes).